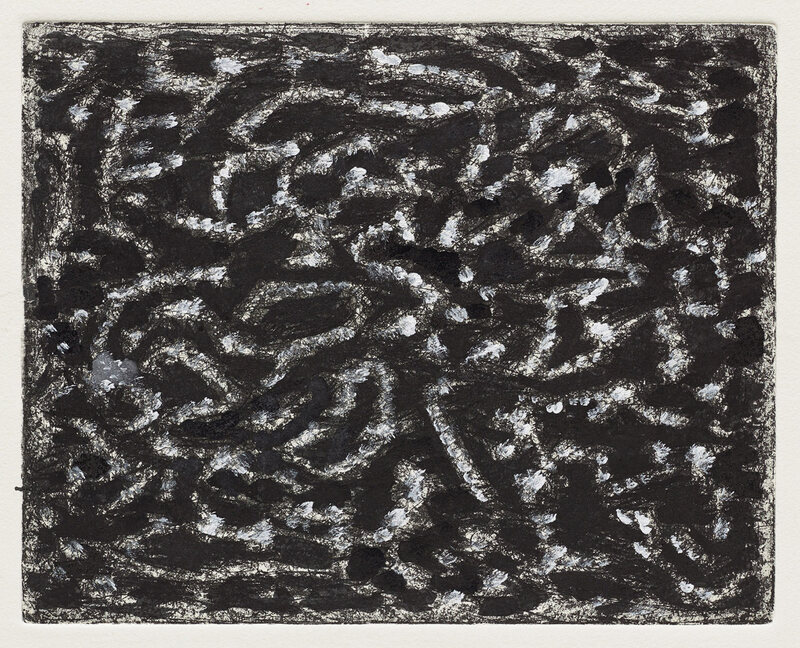 "Altered States: The Etchings of Richard Pousette-Dart"
Richard Pousette-Dart, Black Moving (1979), etching with acrylic mounted on card, image 8 x 10 inches, sheet 14 x 15 7/8 inches. Art ©2017 Richard Pousette-Dart. The Richard Pousette-Dart Estate / Artist’s Rights Society (ARS), New York. Courtesy Del Deo & Barzune, New York. The recent exhibition “Altered States” at Del Deo & Barzune in New York has brought together for the first time a group of etchings that Richard Pousette-Dart (1916–1992) produced between 1974 and 1980. Documenting this rarely seen work is an illustrated catalogue with an essay by Charles H. Duncan. A painter associated with the first generation of Abstract Expressionists, Pousette-Dart, like Mark Rothko, made the transition from gestural, mildly surrealist abstraction to a luminous, spiritual minimalism. Rather than approach the prints as they relate to his painting, however, it is productive to consider this body of work as an independent graphic enterprise. 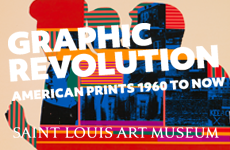 Though he made some etchings early on in his long career, these prints, done in collaboration with the printer Sylvia Roth of Hudson River Editions, constitute Pousette-Dart’s most substantial involvement with printmaking. The plates Roth and Pousette-Dart worked with were of two sizes: slightly under 18-by-24 inches or 8-by-10 inches. None were printed in editions, but the prints fall into distinct groups of variations arising from particular plates— overpainted impressions from the same plate, or sequential proofs from a plate as it was reworked, or both. Many have additions made by hand: unusual ink applications on the plate after wiping but before printing; acrylic paint or printing ink applied to the printed impression directly by brush; and/or graphite gestures drawn on top. 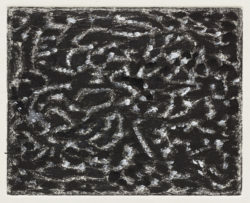 Pousette-Dart’s strategy seems to have been to use black-and-white etchings as jumping-off points for direct manipulations, producing related groups of unique works on paper. 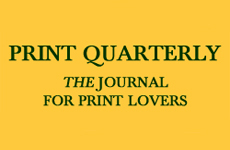 Given this premise, it is remarkable just how print-like the affect of the work is. With a few exceptions there are no faux paintings or de facto monotypes here. Establishing the cycle of technical elaboration and experimentation, Light Sublime (1979) begins as simplicity itself. The 18-by-24-inch plate is covered with a field of pulsing, sharp, fine lines and dashes, swirling and energized. We see just the hand and etching needle at work. The brevity of the marks and their thinness relative to the large plate generate an atmospheric endlessness, an airy field in motion. 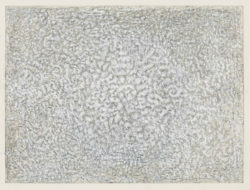 Its aura is closer in spirit and connotative potential to Mark Tobey’s calligraphic white writing than to the physicality of late Abstract Expressionism. There is a sense of image in Pousette-Dart’s weather, an immanent subjectivity that flirts with shape and event. But there is also a sympathetic connection to the arm’s-length objectivity of the late ’70s, with its minimal fields, lack of figuration and focus on process. 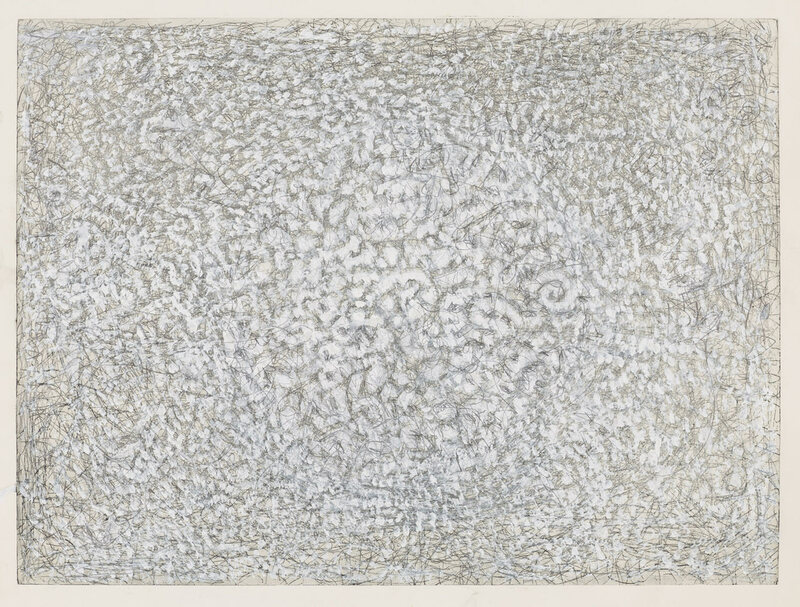 Richard Pousette-Dart, Galaxies of Being (1974), etching with graphite and acrylic, image 17 3/4 x 23 3/4 inches, sheet 22 1/2 x 28 1/2 inches. Art ©2017 Richard Pousette-Dart. The Richard Pousette-Dart Estate / Artist’s Rights Society (ARS), New York. Courtesy Del Deo & Barzune, New York. The earliest print in the show, Galaxies of Being (1974), predates the rest by several years. Its foundation is a field of etched lines and small gestures similar to Sublime Light, over which Pousette-Dart laid cloud-like billows of white acrylic and graphite that swirl and coalesce in delicate patterns. At the center one can just make out the presence of a subtle circular shape; five years later this structure reappears, echoed and enhanced, in the unadorned line etching Center of Being IV (Original Black Circle) (1979). A sequence is established here: a proof printed in black, overworked with paint and graphite, followed by further work on the plate, and a new stand-alone etching that is not meant as part of an edition, but as a new moment of thought. Black Moving (1979) and Upon This Field (1979) are smaller plates that exert their physicality through graphic tactility. Their gestures are less atmospheric, more concrete, and rely less on building with line. Black and White Landscape (1979) goes further in this direction: the calligraphic events that make up its underlying field are enlarged and wildly dramatic. They seem to leap about the plate to avoid being swallowed by the loose grid of misaligned blobs (these blobs have near relations in some smaller prints such as White Driving Black ). The drama of Black and White Landscape was produced by selectively enlarging certain elements, which reduces the regularity of the patterning and allows the image to assert itself in barely controlled expansion. Naples Paths (1979) and Etching–3 (1979) are also small, strong, black-and-white etchings. Both were printed from the same plate of languid, tangled line (one plate is inverted vertically), then ink was poured onto the wiped plate to make discrete freehand meanders that are different in each impression, creating two similar but distinct images. These exaggerated gestures, floating on top and seemingly disconnected from the field below, are the closest connection here to painterly Abstract Expressionism rather than the integrated field. As much as the exhibit seems to be about intuitive transformation and experimentation, 11 of the 25 prints on view were straight black-and-white etchings. Spinning out graphic gymnastics was one of Pousette-Dart’s preoccupations, along with conjuring up animated voids; he invokes the presence of nothing and everything at the same time. In another group of 18-by-24-inch unaltered etchings, floating glyphic forms emerge from antic geometries of line. Evanescent shapes ease in and out of focus, meshed in an oceanic visual buzz. Jasmine Lights (Master, 1979) and Angled Lights II (1979) aim for this sense of meditative, all-enveloping nonevent. Without the graphic dramatics that drive some of the other prints, these ask us to slow down, take a deep breath and concentrate on something just on the verge of visibility. What we see is in front of our eyes but also a little bit somewhere else. The fast glance holds no water here. These works function as triggers for an introspective connection that came to define Pousette-Dart’s later work in painting. 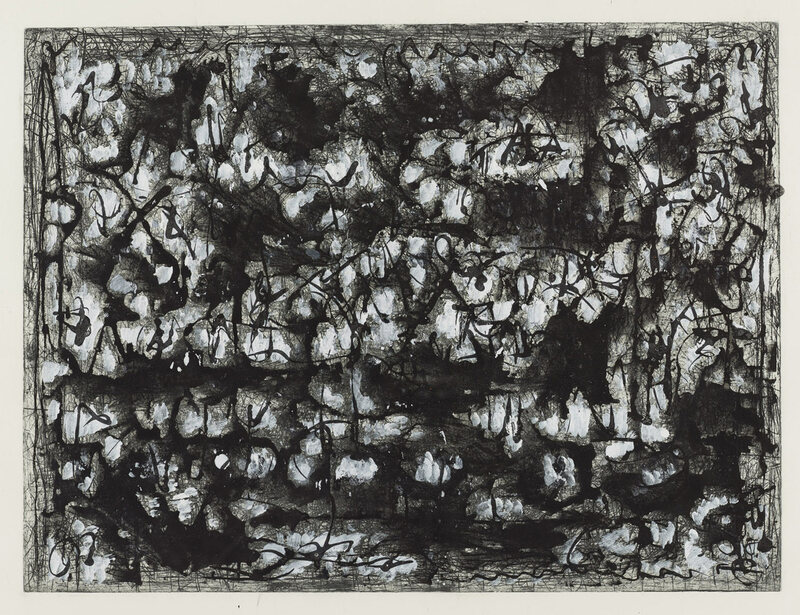 Richard Pousette-Dart, Black and White Landscape (1979), etching with acrylic, image 17 7/8 x 23 7/8 inches, sheet 22 3/8 x 31 1/4 inches. Art ©2017 Richard Pousette-Dart. The Richard Pousette-Dart Estate / Artist’s Rights Society (ARS), New York. Courtesy Del Deo & Barzune, New York. By contrast, one group of four small prints forms a stage for spontaneous elaboration; these are true painting-print hybrids. Each consists of a sharply defined, hefty oval nestled in a rectangle that echoes the edges of the plate. The four constitute a sequence that proceeds through variations of inking followed by layers of paint, ending with color emerging as the dominant theme. 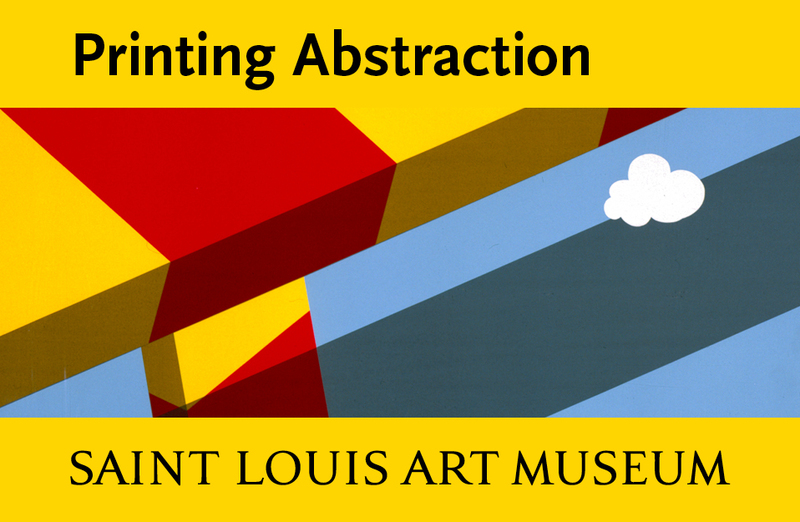 This exploration of innovation and variety ends up neatly straddling the spheres of printmaking and painting. In Blue Sonata (1980), buoyant blue and white acrylic applied over the pale gray-green printing ink rises into dematerialized chromatic radiance. The tactility of the linear gestures, the fields, and the emerging forms dissolve into color. This work could easily stand alone, yet in the context of this exhibition we can recognize it as the result of an extended process of print-based experimentation. In these four works we can see Pousette-Dart attempting to reconcile printmaking—its linear roots and permutational invitations to explore—with his other work. At certain points his additions to the etchings push into the realm of painting, a threshold that coincides with the increased appearance of color. Pousette-Dart extends and transforms the graphic persistence of the black-and-white etchings, looking for transcendence—something, nothing and everything at the same time. There is a climate of genesis in this body of work, of origins moving forward and backwards. 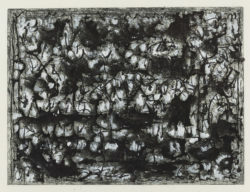 The aptly named black-and-white Etching–1 (1979) defines the elements and techniques that emerge and evolve through the prints that follow. With a dark mass in the center of a field of manic linear gesture, the simplest of images echoes all the separations that made the world, beginning with darkness and light.